It’s only been a little over a month since I got my amazing, large, wonderful air fry! And I love almost everything I have made it in so far (recipes are in the works!). 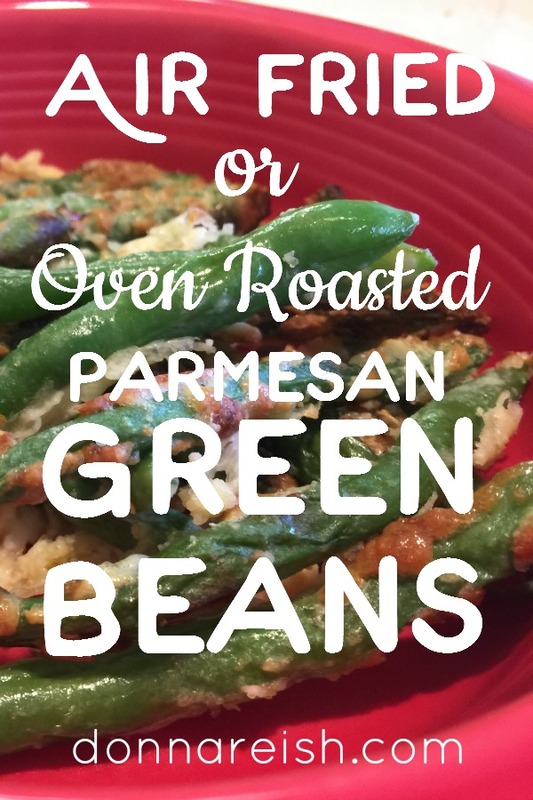 And I love these Parmesan Green Beans in it if I only want to make a small amount for two. 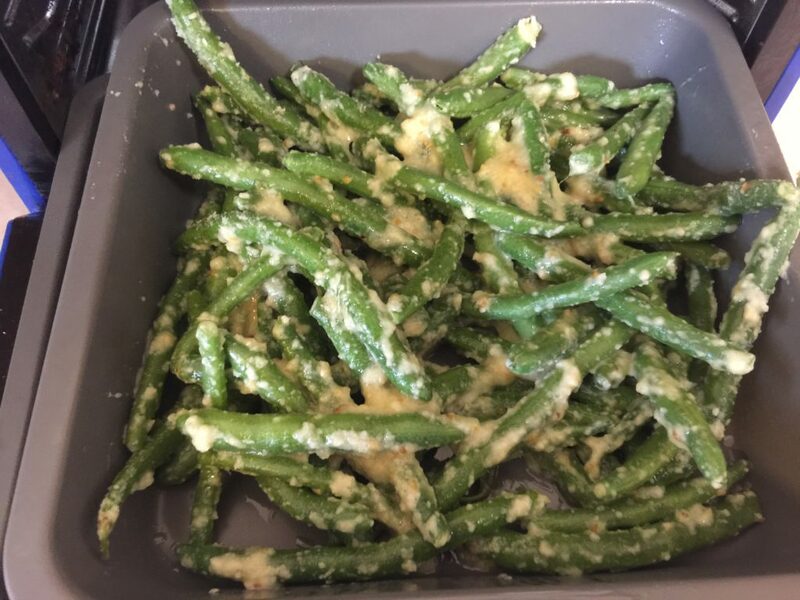 1) I’ve been making these amazing Oven Roasted Parmesan Green Beans for over a year–and they are the most amazing low carb, healthy finger food hot veggie I have ever had! 2) Don’t try other recipes without the egg. I had several recipes that I was trying out, attempting to simplify it (they’re already simple–but I love making things simple, cutting out steps, etc.!). The ones without the egg just really did not hold the coating very well. This combination is the one I settled on for the most flavor in every bite! 3) I make this in the oven unless I am making 6 ounces for one or two of us. It is hard to keep the coating on a large amount because they are not in one layer. If you don’t have a six quart or larger fryer, I don’t recommend them in there. 4) This can be doubled–which I like to do when all fifteen of the kids and kids-in-love are here–but you will need two jelly roll pans (or huge baking sheets with sides). Don’t double the recipe without doubling the pan size! 5) One layer is the secret to making these crispy with a little Parmesan goodness on every bean. Stacking, bunching, or crowding makes a casserole–not a roasted dish! 7) If your beans are not washed and fully dried when making this dish, you will need to drain them in a colander lined with paper towels. Then transfer to paper towel on counter and let dry, blotting them occasionally. The “goop” will not stick to wet green beans (which is one reason that the frozen ones do not work as well). 9) No adaptation ideas needed–this dish is low carb, low fat, healthy, real food, and family-friendly! Yay! In a large bowl whisk oil, minced garlic, egg, pepper, and Favorite Seasoning Mix together. 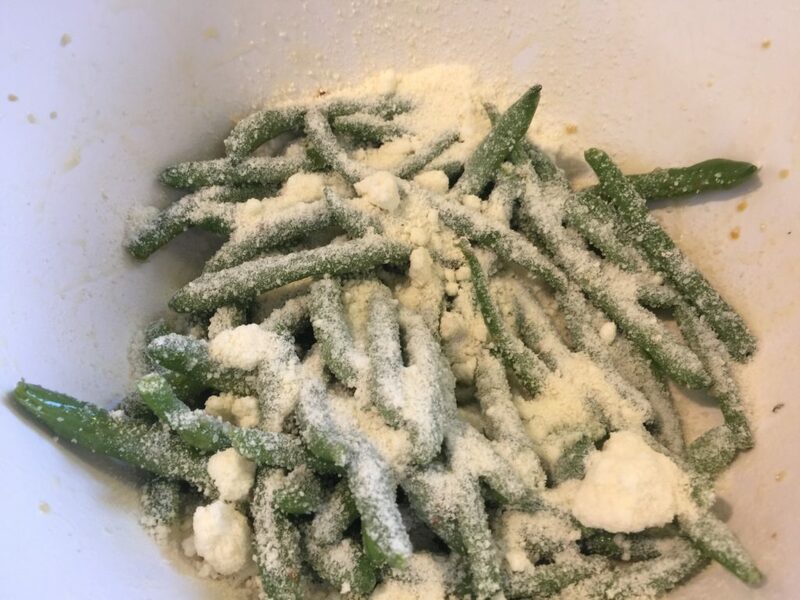 Sprinkle Parmesan on the green beans and toss gently, again fully coating. Transfer to 9 x 9 baking pan if using air fryer (see air fryer size needs in above paragraphs) or huge baking sheet with sides (large jelly roll pan works best). Oven: Bake for 12-15 minutes or until golden. Finishing When Oven Roasting: To crisp, heat for a minute or two under broiler. No need for crisping afterwards in the fryer.